அவுமியா (Haumea) ஞாயிற்றுத்தொகுதியில் நெப்டியூனுக்கு அப்பால் காணப்படும் ஓர் குறுங்கோள் ஆகும். இது அமெரிக்க அறிவியலாளரான மைக் பிரௌன் என்பவரால் கண்டுபிடிக்கப்பட்டது. இது நீள்வட்ட வடிவமுடையது என அனுமானிக்கப்படுகின்றது. இது சூரியனைச் சுற்றி வர 283 புவி ஆண்டுகளை எடுத்துக் கொள்ளும். அவுமியா சூரியனில் இருந்து 35AU முதல் 50AU வரையிலான தொலைவில் காணப்படும். ↑ "MPEC 2010-H75 : DISTANT MINOR PLANETS (2010 MAY 14.0 TT)" (2006 provisional Cubewano listing). Minor Planet Center (2010-04-10). பார்த்த நாள் 2010-07-02. ↑ Marc W. Buie (2008-06-25). "Orbit Fit and Astrometric record for 136108". Southwest Research Institute (Space Science Department). பார்த்த நாள் 2008-10-02. ↑ D. Ragozzine, M. E. Brown (2007). "Candidate Members and Age Estimate of the Family of Kuiper Belt Object 2003 EL61". Astronomical Journal 134 (6): 2160–2167. doi:10.1086/522334. Bibcode: 2007AJ....134.2160R. ↑ 4.0 4.1 "Jet Propulsion Laboratory Small-Body Database Browser: 136108 Haumea (2003 EL61)". NASA's Jet Propulsion Laboratory (2008-05-10 last obs). பார்த்த நாள் 2008-06-11. ↑ 5.0 5.1 5.2 D. L. Rabinowitz, et al. (2006). "Photometric Observations Constraining the Size, Shape, and Albedo of 2003 EL61, a Rapidly Rotating, Pluto-Sized Object in the Kuiper Belt". Astrophysical Journal 639 (2): 1238–1251. doi:10.1086/499575. Bibcode: 2006ApJ...639.1238R. ↑ 6.0 6.1 J. Stansberry, W. Grundy, M. Brown, et al. (2008). "Physical Properties of Kuiper Belt and Centaur Objects: Constraints from Spitzer Space Telescope". The Solar System beyond Neptune (University of Arizona Press). Bibcode: 2008ssbn.book..161S. ↑ 7.0 7.1 E. Lollouch, et al. (2010). ""TNOs are cool": A survey of the trans-Neptunian region II. The thermal lightcurve of (136108) Haumea". Astronomy and Astrophysics 518: L147. doi:10.1051/0004-6361/201014648. Bibcode: 2010A&A...518L.147L. ↑ D. Ragozzine , M. E. Brown (2009). "Orbits and Masses of the Satellites of the Dwarf Planet Haumea = 2003 EL61". The Astronomical Journal 137 (6): 4766. doi:10.1088/0004-6256/137/6/4766. Bibcode: 2009AJ....137.4766R. ↑ P. Lacerda, D. Jewitt and N. Peixinho (2008). "High-Precision Photometry of Extreme KBO 2003 EL61". Astronomical Journal 135 (5): 1749–1756. doi:10.1088/0004-6256/135/5/1749. Bibcode: 2008AJ....135.1749L. ↑ Chadwick A. Trujillo, Michael E. Brown, Kristina Barkume, Emily Shaller, David L. Rabinowitz (2007). "The Surface of 2003 EL61 in the Near Infrared". Astrophysical Journal 655 (2): 1172–1178. doi:10.1086/509861. Bibcode: 2007ApJ...655.1172T. ↑ D. L. Rabinowitz et al. (2008). "The Youthful Appearance of the 2003 EL61 Collisional Family". The Astronomical Journal 136 (4): 1502. doi:10.1088/0004-6256/136/4/1502. Bibcode: 2008AJ....136.1502R. 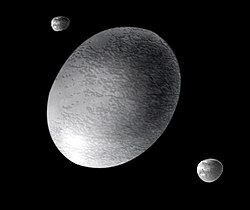 ↑ "AstDys (136108) Haumea Ephemerides". Department of Mathematics, University of Pisa, Italy. பார்த்த நாள் 2009-03-19. ↑ "HORIZONS Web-Interface". NASA Jet Propulsion Laboratory Solar System Dynamics. பார்த்த நாள் 2008-07-02. விக்கிமீடியா பொதுவகத்தில் Haumea என்னும் தலைப்புடன் தொடர்புடைய பல ஊடகக் கோப்புகள் உள்ளன. இப்பக்கத்தைக் கடைசியாக 1 நவம்பர் 2016, 03:17 மணிக்குத் திருத்தினோம்.